We want the best for our children. We want them to be as successful in life as possible, and we do everything in our power to help them with that. If you’ve landed in this article, then you are on the right path. Teaching your children music from a young age can be very beneficial for them because music is art, and it helps them grow up to be more creative than other children. If you want to teach your children music, you should first buy them a musical instrument. The best one, in my opinion, is the guitar because it’s the most popular and one of the best instruments available out there. They are also not very expensive and usually don’t require extra equipment. I still remember the day my dad bought my first guitar. I was extremely happy and couldn’t wait to start to play it. I started playing the guitar more than 30 years ago, and it’s been my best friend ever since. Even though children nowadays only care about their tablets and computers, you should try to prevent them from getting addicted to video games, and get them interested in another hobby instead. After doing hundreds of hours of research, we decided to prepare this article to help parents choose the best acoustic guitar for their kids. We tried to keep the list as affordable as possible without compromising quality. Let’s get started! Even if you’re not a guitar expert you may already know that when it comes to Fender guitars you’re in for a good quality acoustic guitar. Even though most of their guitars are expensive ones, that doesn’t mean that you have to get a full-size model to get the acoustic experience you need for your lessons. Fender MA 1 provides you with the quality most of the high-end guitars produce while it still maintains its status as a beginner-friendly guitar. It offers a good combination of playability and style and most importantly it’s very affordable. Fender MA-1 has a very clean traditional look to it, even though at this price length you wouldn’t expect the materials to have any solid wood, but nonetheless, the guitar rocks a classic x-bracing on the top, with a very good looking laminated sapele on the back and sides, and to give its looks a sense of elegance the Fender MA-1 has a touch of sophisticated satin. The compact body ensures that this guitar is going to be very comfortable for smaller players because the neck rocks a short 1’69 nut width and a C-shaped profile. The neck is made out of nato wood and is polished with the same sophisticated touch of satin as the body, with a rosewood fretboard. In conclusion, Fender MA-1 demonstrates a stable build quality and its playability is perfect for someone who’s just starting out to learn to play the guitar, all of this is thanks to the size of the neck which makes it easier for the player to jump around the chords without getting very tired on your first lessons which tend to over fatigue your hands. Want to read more? Check out our Fender MA-1 Review. This compact guitar offers the player the tone of a full-size dreadnought acoustic guitar without the big size which makes it easier for the players to carry it around, categorizing this guitar as a more travel-friendly instrument. it’s also easy-to-use which makes it a perfect choice for a young player or players who have trouble wrapping their hands around a guitar. Yamaha JR1 even though it’s a small and a cheap acoustic guitar it has a well-built construction, this acoustic guitar demonstrates that it doesn’t have to cost you a fortune to have a quality guitar. Furthermore, Yamaha used its simplicity formula on this acoustic. They made the dreadnought size a 3/4 which contributes to making this guitar easier to carry around be it for traveling purposes or taking it with you just about anywhere. Its tonewood is made of spruce on the top, meranti was used for back and sides, the neck is made from nato wood, even though it has no fancy looks, the neck delivers that comfort which increases the guitar’s playability, the fingerboard and bridge are made out of rosewood. Overall, this build has better quality than you could ask for at such a low-range price list. 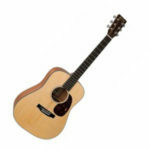 Traditionally speaking travel-friendly acoustics don’t usually have a powerful volume, and that’s because the dreadnought size makes this guitar a perfect choice for traveling, but with Yamaha’s JR1 this story is a tad bit different, while the dreadnought is smaller in size in this one it still delivers crisps trebles and clean bass. Be sure to also check out the Yamaha FG JR1 review. This fun to play, well-balanced constructed acoustic-electric guitar is a very compact guitar to have with you when you’re traveling, its undersized design allows you to produce oversized possibilities. Yamaha APXT2 is an excellent acoustic-electric guitar for practicing if you’re just starting out to learn about strumming down those chords. The Yamaha’s APXT2 back and sides are made of meranti wood which tends to be less costly than mahogany wood and the top is attractively splayed with spruce. This small guitar has a fretboard made of rosewood with 21 frets and dot inlays and the bridge is made out of rosewood too. Judging from the size this acoustic-electric guitar has to offer and the materials it possesses it’s quite impressive and all of these factors contribute to increase the guitar’s playability and durability. the Yamaha’s APXT2 features also an art based system which helps you tune the guitar with great sensitivity and supplies the player with great accuracy for quick tuning. This isn’t one of those classic guitars that have nylon strings. 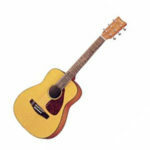 This is a steel-stringed acoustic-electric guitar with a smaller body regard to a full-size dreadnought. As an acoustic, it’s not going to be as powerful as a big dreadnought would be, but nonetheless, it’s designed to produce a crisp sound when it’s plugged into an amp or a PA system. The exotic woodwork provides the guitar with so much more detail when it comes to flaunting the woodgrain and the spruce top offers great adaptability to the tonal range for all styles you may want to execute. We mention in our full review of the Yamaha APXT2 why we would choose this guitar over its competitors in its price range. The petite bodied Rogue Starter acoustic guitar remains an astonishing bargain for a starter guitar. 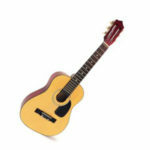 Its small profile 7-8″ scale makes it much playable for children or striving guitarists with smaller body build frames and hands. We’re going to look into this small-bodied acoustic guitar which produces a dense sound, has a powerful build quality, a super inexpensive price, and yet some cool looks. The first impression this guitar makes is the case that this astonishing acoustic guitar utilizes a 3/4 mahogany body, which is linked to considerably more expensive acoustic guitars. Furthermore, this guitar is decorated with a firm maple neck and a typical rosewood fingerboard. Constructed quality is substantial, and while some fret sound is present and vibration isn’t precisely top-level, we are still more than satisfied when the price tag is taken into consideration. 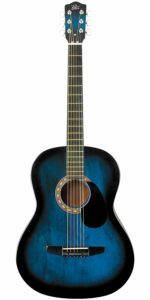 Additionally, the six-strings this acoustic guitar features does an uninterrupted job in keeping the guitar in tune for a great period of time. This piece of craftsmanship incorporates in this mix a rosewood bridge that has no pins. This helps the guitar secure a precise intonation and balance. 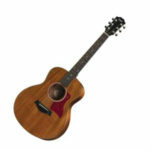 This acoustic guitar is also equipped with a set of Martin quality strings. Your kid comes up to you and tells you that the inspiration to become a guitar player has struck him, you’ve found the right teacher for him or the place to take the lessons to learn to play this 6 stringed instrument, the only thing you need now to help him begin the journey of his life as a guitar player is a well-balanced guitar. That’s where the Honer HAG250P comes in. 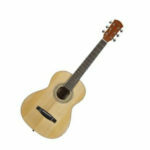 This nylon-stringed guitar designed specifically for the little hands, is a pretty awesome place to start. 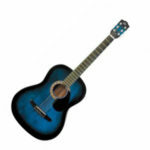 The nylon-strings make this guitar’s playability easier and helps the beginners play with the guitar longer. Hohner HAG250p has a traditional style that’s used for almost 95% of the classic guitars that exist out there. This guitar is a 1/2 size, so it’s perfect for kids who are 8-9 years old. The body’s back, top and sides are made out of laminated agathis, followed by a mahogany neck and the fretboard is made of a generic hardwood. Its neck offers 18 frets this provides more than enough room for a beginner to play on. The cons of the hardware design is perhaps where the HAG250P is going to let you down a little. Its six open gear tuners are made with plastic buttons, which work perfectly fine but do not offer enough tuning stability. When tuned, they do provide with a delightful sound but that falls short when it’s used for a long period of time, the tunning is going to need tweaking from time to time. But as you may wonder, the sound the Hohner HAG250P offers is quite artlessly but assuredly not bad. Furthermore, given that the guitar is tuned the sound is distinct and clear and provides the beginners with what they may require in terms of projection and tone. After we did the review of the Hohner HAG250P, we took it out and tried playing it in crowded places. We got a few heads turned and that means that it did what it was supposed to. Have you ever imagined of playing the guitar? 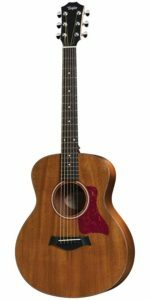 Arcadia DL36NA is sketched and built to be the greatest playing, excellent sounding acoustic guitar for the entry and intermediate level guitar performer as well as the perfect parlor guitar. Emphasizing finely grained select spruce tops for steady tone and projection, this guitar is ideal for all styles of music. The superior internal bracing ensures that you experience stability and resonance throughout your strumming sessions. In addition, the deluxe black-back die-cast tuners guarantee slip-free, accurate tuning. The Arcadia DL36NA parlor size comes in natural, black, and tobacco sunburst and is available in 2 different sizes. For those who prefer a full-size guitar, the DL41 model will suit you while those who prefer smaller guitars will love the parlor size DL36NA model. The Arcadia DL36 has a good sound, robust and strong, resonant and clear. it plays easily on the fret board, with good action, and it is made with quality laminate craftsmanship. It’s easy to tune and stayed in tune after multiple days playing. Classical acoustic guitars are a fashionable choice with beginners as they provide with reliable, unique sounding instruments that are a joy to learn and yet won’t break the bank! 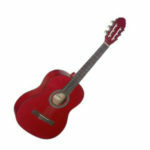 This C430 guitar in 3/4 size is no exemption and is also notable amongst education services. It is perfect for 8-11-year-olds and will get them off to a great start in their musical adventure. Crafted to perform beautiful pieces on this three-quarter scale acoustic C430 guitar by Stagg. Sized perfectly to suit the unique needs of smaller guitar players, the C430 does not sacrifice any quality along the way. The instrument is decorated in a delightful red matte and the body is constructed entirely from great quality linden wood that contributes to an excellent tone. 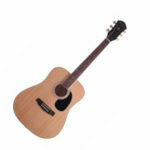 There are artificial rosewood fingerboard and bridge and nylon strings that provide a very nice feel. Lastly, the nickel machine heads will assist you to tune your instrument efficiently and assure it maintains its tuning well. If you enjoyed this short introduction, i urge you to read the Full Stagg C430 M Review. 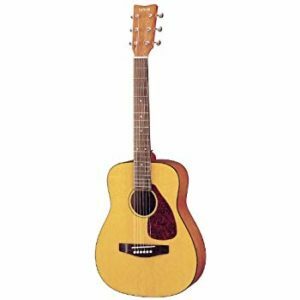 Acoustic guitar business these days is overwhelmed with a few body shapes at loads of various price points. It makes picking your fit extra complicated than ever, which makes you wonder if that dreadnought is truly better than this one, or this one? These comparisons are no doubt why numerous brands are providing with something a little different. For instance, smaller guitars for traveling purposes, or even bigger guitars, like baritones. In a packed market, you ought to be unconventional. The time has come where it’s small that’s becoming the new big, in the acoustic world, there’s Ed Sheeran and his little Martin. So, where does this fashionable Martin Dreadnought Junior click within all of this? Well, specifically halfway between the Little Martin and a full-size Martin dreadnought. But it’s not only the size at play here. The Martin Dreadnought Junior might be downsized, but it’s quite grown-up in build, including an all-solid wood foundation, proper mortise and tenon neck, a bound top edge and simplistic soundhole rings. Inside this fine piece of craft,the X bracing is finely arranged in a classic fashion. It might not possess the tremendous sounding or width, harmonically addressing, of the full-size dreadnought, but there is a forceful midrange and a lightly textured edge and a lighter smoothness, but nonetheless, it maintains a Martin stamp: classic and old-school. 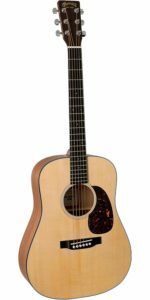 Overall, this piece of craft is made for serious youthful performers and it’s an exceptional entry into Martin’s legacy, but the extra compact size indicates that much more mature player will dig the Dreadnought Junior too. In the Martin DJR review, i mentioned that it’s very expensive, so you should consider that too. Bigger is always better, correct? When we’re talking about guitars, particularly ones like some you’ll discover in the Little Martin line of acoustic guitar, this often-repeated set of words isn’t necessarily true. This fashion of acoustic guitars, frequently cited to as a travel-friendly or a parlor guitar, won’t substitute your full-size acoustic guitar any time soon, but it does have its benefits. Best of all, if you pick your Little Martin carefully, you don’t actually have to swap sound for size. Martin used often artificial elements when they produced the Martin LXM. Alternatively to laminate wood, they’ve applied spruce and mahogany patterned high-pressure laminate. However, Martin still provides the player with astounding sound quality. Their high-pressure laminate and the way it was all set together, produced more than a pleasing performance. uses the same traditional configuration. The rosewood bridge rocks a qualitative white tusq saddle, the nut is made of white tusq too. 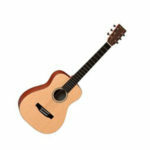 Tunning elements are Martin’s own trademark design and produce a fairly suitable quality of intonation. The strings Martin’s brand provide are the most durable strings you can find in the market their quality goes beyond years and their life span is everlasting. In conclusion if you’re looking for an acoustic guitar that can deliver the highest quality possible while on a trip far from home then Martin LXM is a perfect choice, this guitar comes at an affordable price. It’s not as powerful as a full-sized dreadnought, but it’s far from sounding dull. 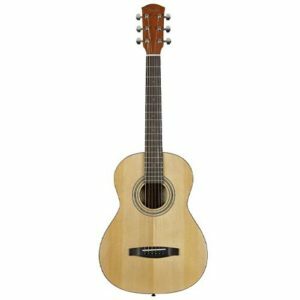 A compressed guitar that provides the player with great quality, Taylor GS Mini is an enjoyable small guitar that can be regarded as an acoustic superstar. Composing a vibrant, powerful quality sound that would go contradictory to the maxim, size matters, this guitar is extremely portable and is perfect to have around when you want to have a piece of amazing instrument on the go, yet it is still very pleasant to hold and perform in the warmth of your house or just about anyplace. 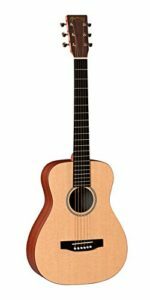 Big guitars that have large dreadnoughts are mandatorily demanded to be loud and have a robust sound, given that size is being here the main factor, smaller acoustic guitars like Taylor GS Mini are expected to be the opposite of that, with a notably lower volume. Nonetheless, this sound obstacle has been improved by the Taylor GS Mini thanks to the elements used and the originality portrayed by the company. The guitar’s rear and sides are both made out of sapele while the top is made from substantial sitka spruce, a feature frequently encountered in high-end acoustic guitars. 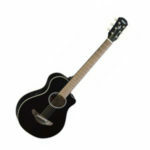 Most of the acoustic guitars use low-quality wood for the bridge and fretboard, but this guitar utilizes real ebony wood. Overall, Taylor has gained a respected reputation in the guitar making business for providing the market with most playable guitars in history. 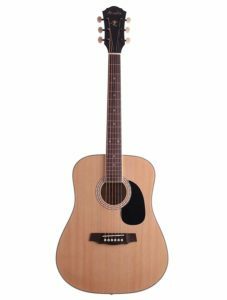 The Taylor GS Mini ensures that its easy-to-play will keep you entertained for days to come and won’t leave you bored, given the sound quality it provides. As we mentioned in our full Taylor GS Mini review, it’s a very lightweight guitar, and this is a very important factor. Actually, that is one of the main reasons why this guitar is ranked #1 in this list!